The American general and statesman Lewis Cass was born at Exeter, New Hampshire, on the 9th of October 1782. He was educated at Phillips Exeter Academy, joined his father at Marietta, Ohio, about 1799, studied law there in the office of Return Jonathan Meigs (1765-1825), and was admitted to the bar at the age of twenty. Four years later he became a member of the Ohio legislature. During the War of 1812 he served under General William Hull, whose surrender at Detroit he strongly condemned, and under General William Henry Harrison, and rose from the rank of colonel of volunteers to be major-general of Ohio militia and finally to be a brigadier-general in the regular United States Army. In 1813 he was appointed governor of the territory of Michigan, the area of which was much larger than that of the present state. This position gave him the chief control of Indian affairs for the territory, which was then occupied almost entirely by natives, there being only 6000 white settlers. During the eighteen years in which he held this post he rendered valuable services to the territory and to the nation; he extinguished the Indian title to large tracts of land, instituted surveys, constructed roads, and explored the lakes and sources of the Mississippi river. His relations with the British authorities in Canada after the War of 1812 were at times very trying, as these officials persisted in searching American vessels on the Great Lakes and in arousing the hostility of the Indians of the territory against the American government. To those experiences was largely due the antipathy for Great Britain manifested by him in his later career. Upon the reorganization of President Andrew Jackson's cabinet in 1831 he became Secretary of War, and held this office until 1836. It fell to him, therefore, to direct the conduct of the Black Hawk and Seminole wars. 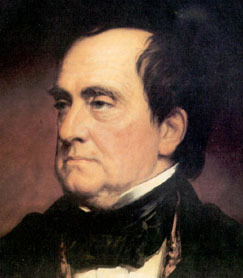 He sided with the president in his nullification controversy with South Carolina and in his removal of the Indians from Georgia, but not in his withdrawal of the government deposits from the United States Bank. In 1836 General Cass was appointed minister to France, and became very popular with the French government and people. In 1842, when the Quintuple Treaty was negotiated by representatives of England, France, Prussia, Russia and Austria for the suppression of the slave trade by the exercise of the right of search, Cass attacked it in a pamphlet entitled "An Examination of the Questions now in Discussion between the American and British Government Concerning the Right of Search", and presented to the French government a formal memorial which was probably instrumental in preventing the ratification of the treaty by France. In this same year the Webster-Ashburton treaty between Great Britain and the United States was concluded, and, as England did not thereby relinquish her claim of the right to search American vessels, Cass, after having taken such a decided stand in this controversy, felt himself in an awkward position, and resigned his post. His attitude on this question made him very popular in America, and he was a strong, but unsuccessful, candidate for the Democratic nomination for the Presidency in 1844. From 1845 to 1848 and from 1849 to 1857 he was a member of the United States Senate, and in 1846 was a leader of those demanding the "re-annexation" of all the Oregon country south of 54 degrees 40 minutes or war with England, and was one of the fourteen who voted against the ratification of the compromise with England at the 49th parallel. He loyally supported James Knox Polk's administration during the Mexican War, opposed the Wilmot Proviso, and advocated the Compromise Measures of 1850 and the Kansas-Nebraska Bill of 1854. In his famous "Nicholson letter" of December 1847 he made what was probably the earliest enunciation of the doctrine of "popular sovereignty", namely, that the people of the territories should decide for themselves whether or not they should have slavery. In 1848 he received the Democratic nomination for the Presidency, but owing to the defection of the so-called "Barnburners" he did not receive the united support of his party, and was defeated by the Whig candidate, Zachary Taylor. His name was again prominent before the Democratic convention of 1852, which, however, finally nominated Franklin Pierce. On account of his eminently conservative attitude on all questions concerning slavery, General Cass has been accused of pandering to the southern Democrats in order to further his political aspirations. His ideas of popular sovereignty, however, were not inconsistent with the vigorous Democratic spirit of the west, of which he was a typical representative, and it is not clear that he believed that the application of this principle would result in the extension of slavery. As the west became more radically opposed to slavery after the troubles in Kansas, Cass was soon out of sympathy with his section, and when the Republicans secured control of the legislature in 1857 they refused to return him to the Senate. President James Buchanan soon afterward made him Secretary of State, and in this position he at last had the satisfaction of obtaining from the British government an acknowledgment of the correctness of the American attitude with regard to the right of search (or "visitation", as Great Britain euphemistically termed it.) In December 1860 he retired from the cabinet when the president refused to take a firmer attitude against secession by reinforcing Fort Sumter, and he remained in retirement until his death at Detroit, Michigan, on the 17th of June 1866. He wrote for the North American and the American Quarterly Reviews, and published Inquiries Concerning the History, Traditions and Languages of Indians Living Within the United States (1823), and France: Its King, Court and Government (1840).